A Mediterranean spill of health. 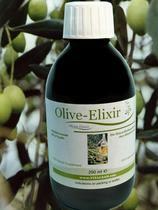 Olive leaf & oil extract – the concentrated power of olives helps reaching a stable blood pressure, lower cholesterol levels and fuels physical and mental well-being. Olive oil contains a huge amount of valuable unsaturated fatty acids that help our body reach healthy cholesterol levels as well as stable blood pressure. Inside, these unsaturated fatty acids reduce the risk of cardiovascular diseases and give a boost to fat metabolism. Outside, the consequence of this is a slimmer figure and healthier and smooth looking skin. 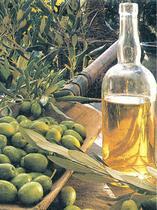 Olive-Elixir contains the concentrated power of top-quality cold-pressed Southern-Italian olives and their leaves. Demineralized water, Fructose, Sorbitol, Olive (Olea europea) dry leaf extract containing 12% Oleuropein, Olive (Olea europea) oil extract, Xanthan Gum, Lemon and Orange-juice aroma, Citric Acid, Potassium Sorbate. • Take an overall dose of 15 ml (1 measure cup) once or split – as more convenient – half an hour before meals. Since juice is concentrated, we recommend taking a dose accompanied by half a glass of water.